AK is a non-invasive system that uses muscle testing and other standard methods of diagnosis, including patient history, physical exams, lab work, and other specialty exams (as needed), to evaluate the structural, chemical, and mental aspects of a person's health and body function. In general, the doctor finds a muscle that tests weak and attempts to determine why that muscle is not functioning properly. The doctor evaluates and applies the therapy that will best eliminate the muscle weakness and help the patient. Therapies utilized can include chiropractic adjustments, myofascial therapies, cranial techniques, meridian therapy, clinical nutrition, dietary management, deep-level emotional healing, evaluating environmental irritants, and various reflex procedures. What is the Triad of Health? 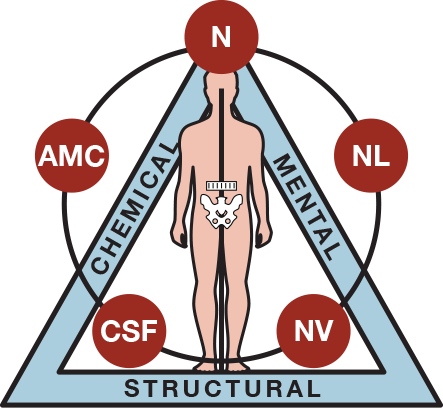 The International College of Applied Kinesiology (ICAK-USA) describes the triad of health as a tool used to determine the proper balance of three basic causes of health problems: structural, chemical, and mental. When a person experiences poor health, it is due to an imbalance in one or more of these three factors. All health problems, whether functional or pathological, are involved with one or more of these three factors. This is not new to chiropractic, as its founder, D.D. Palmer observed, "The determining causes of disease are traumatism, poison and autosuggestion" (from his text "The Science, Art, and Philosophy of Chiropractic"). Physicians who are aware of the triad of health and evaluate every patient for all three sides increase the ability to find the basic underlying cause of a patient's health problem. AK skills are developed and approved by the International College of Applied Kinesiology Board of Standards. These skills are refined from many disciplines, including Chiropractic, Osteopathy, Medicine, Dentistry, Acupuncture, Biochemistry, Psychology, Homeopathy, and Naturopathy, etc. Members of these professions share knowledge through the publications and conferences of the International College of Applied Kinesiology (ICAK) and its chapters. Our patients often have common questions about scheduling appointments at our clinic and we have compiled them for you! Check out our FAQ!